I just returned from an amazing weekend away celebrating my sister's bachelorette party! We rented a chalet in Blue Mountain for the weekend which is such a fun place for a weekend getaway. I have been there several times in both the summer and winter. It's a great place for a winter-y getaway given that it is a ski village. However, absolutely no skiing was actually done! I didn't want to share any of my bachelorette plans before the weekend away to ensure I didn't spoil any surprises for my sister. We kept the décor pretty simple but fitting for winter by hanging some white and gold streamers, I framed a few cute prints and made this glitter letter banner. I found this poster at Party City and added a picture of my sister's fiancée's face. This was used for a game similar to pin the tail on the donkey but waaaay funnier! My favourite DIY projects for the weekend were the goodies we gave the bride to wear. I checked out what the part supply store had but they are always so tacky! I decided to make my own bridal sash and decorative wine glass and thought the ear muff veil and bedazzled glove were funny and fitting for our winter theme!! To make the bridal sash I bought 2 meters of white satin fabric from Michael's for about $5. I attached the ends to one another using some fabric glue. I grabbed the glittered letter stickers from Dollarama and attached them to the sash. I thought I might need some hot glue to secure them but the sticky back was fine. I bought a pair of white gloves from Dollarama along with some rhinestone stickers to attach as a "diamond" ring. I did use some hot glue on these for extra security. I also grabbed white ear muffs when I was at the dollar store and attached white tulle from Michael's to create a veil. This is my favourite!! For the bridal wine glass, I had the glass dipped in gold sparkles leftover from hosting my girlfriend's bridal shower last summer. I made these for the guests to use at the shower and take home as a favour. I added the pearl stickers (also from the dollar store), rhinestones and sparkly letter stickers to spell out " I DO - SHOTS". Clever, right?! :) I also added some of the tulle to the stem to look extra bride-ish! This hunk has made a few appearances at bachelorette and birthday parties over the years. The bridesmaids handmade these awesome sleep masks as favours for all the girls to bring home. We stayed in at the chalet the Friday night enjoying cocktails and games. Check out this Bachelorette Party play list I got inspired by from Pinterest. My girlfriend Low is a chef and owns Solo on Main in Port Stanley, ON. She generously prepared food for the weekend including mac and cheese and kale Caesar salad for dinner Friday and a lemongrass, curry and lentil soup and assorted sandwiches for lunch Saturday. Comfort food with a twist! We also enjoyed simple breakfasts of bagels, croissants, fruit and yogurt, coffee with baileys and mimosas! Saturday we "explored" the village which really means we had drinks at the irish pub. Then we got dressed up to go out for dinner and went out for a few drinks. We all struggled to get packed and cleaned up Sunday morning and prepare for the long trek home. Despite the recovery, it was such an incredible weekend celebrating my big sissy! Her wedding is now less than 3 weeks away now!! WOOT WOOOT!!! Can't wait to share the details and décor with you!! Last Saturday I had the pleasure of hosting my sister's bridal shower along with the other bridesmaids. My mom's beautiful home was the perfect venue for the event! My sister is getting married in February so we wanted to take advantage of the seasonal foliage and decor for her shower as her wedding and bachelorette are taking place in the winter. We used lots of white, gold, burlap and natural accents. The welcome sign is a mirror I had on hand that I wrote on using metallic marker (also from the scrapbooking section at Dollar tree). The marker appears a bit more yellow than gold but it wipes off easily so the mirror can be reused. I made a homemade sugar scrub for the favour for guests to take home. I found a recipe for a vanilla pumpkin sugar scrub on Pinterest that included a free label for the mason jars. I also printed these 'Thank You' tags and attached them using twine. Thankful and Blessed' sign is a free printable found here. Finding pictures of my sister throughout the years was way too much fun!! I made the 'Miss to Mrs' garland using burlap scrapbook paper. Dollar Tree has the cutest scrapbooking materials I often use for crafting. I printed out the letters to use as a stencil and cut them out of the burlap. I strung them on a piece of twine, added two small doilies and some lace ribbon also from the dollar store. I also made a gold and white tissue paper garland to use for the mantle and entry. You can find my tissue paper garland tutorial here. 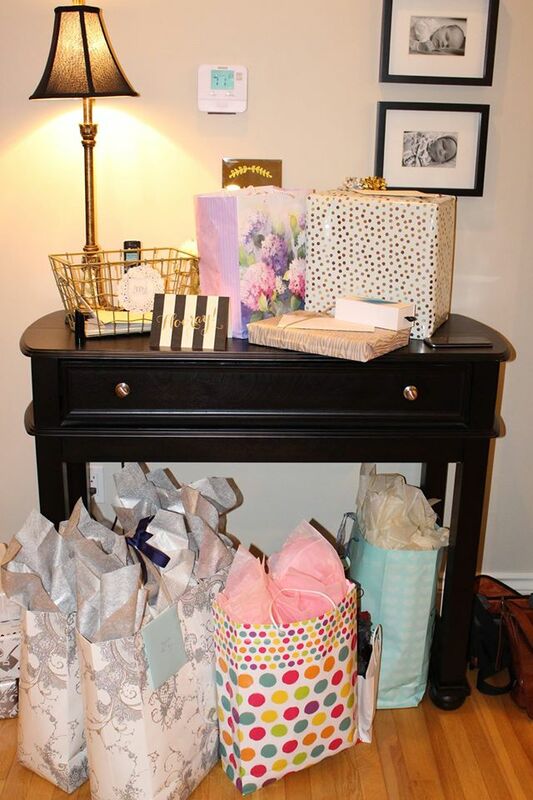 Between myself, my mom and the bridesmaids, we were able to gather some amazing décor items we all had from home to decorate for the shower. 'Eat, Drink & Be Cozy' sign from Etsy. We had a soup bar including veggie and meat chili, coconut curry sweet potato and spicy zappa soup. We paired this with fresh breads, fresh veggies and dip, charcuterie and cheese boards. Served with sangria, white and red wine. For dessert we enjoyed caramel apple dip, pumpkin cheesecake bites and two bite brownies. 'Love is sweet' printable found here. My sister enjoyed the ever awkward task of opening gifts in front of 30 people followed by the toilet paper wedding dress game. I had asked her fiancée 25 questions prior to the shower and she had to guess his answers. This is my absolute favourite shower/ bachelorette game!! 'Showering' the bride with gifts and love!